UPDATED: Tue., July 25, 2017, 6:37 a.m.
Spokane voters can expect a passionate political fight over a proposal to fine coal and oil trains passing through downtown after the City Council sent the question to the November ballot Monday night. The leader of the Spokane County Republican Party and others testifying urged the City Council to publicly oppose the initiative, echoing the opinions of both the city’s hearing examiner and the panel’s own policy adviser questioning the legality of the measure. Supporters say the city must act due to the lack of regulatory standards on shipping Bakken crude and uncovered coal, threatening a fiery derailment downtown that could cost millions of dollars in damage and put citizens’ lives in danger. 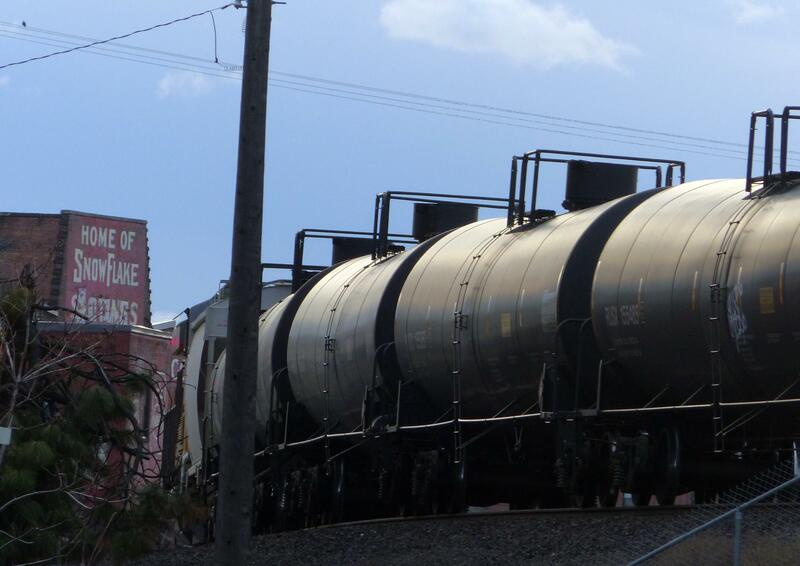 The council had the option of either passing the initiative, which would levy a $261 fine per car carrying oil of a certain pressurization or uncovered coal on downtown rail lines, or sending the issue to voters in November. The council voted 5 to 1 to put the question on the ballot, with City Councilman Mike Fagan casting the lone vote against. City Council President Ben Stuckart was absent from the meeting. Fagan introduced two advisory votes he hoped to include as part of the ballot measure, asking if citizens would approve setting aside money in the general fund to pay for potential legal challenges. “This is going to be a train wreck,” Fagan said, anticipating legal challenges that could cite the legal opinions of city attorneys. City Councilman Breean Beggs, who provided much of the language for the petition signed by 3,296 city residents in favor of a ballot measure, previewed the legal argument that likely will be made in response to the political campaign against it. Congress has created a narrow window for local governments to regulate rail safety where there is a localized threat and federal agencies have been silent, Beggs said. That power has been upheld by federal courts, including in the 9th Circuit, he added. “I think, legally, it is defensible,” Beggs added. Rather than an outright ban, the measure makes it a civil infraction to transport uncovered coal or oil that has a vapor pressure higher than 8 pounds per square inch or a flashpoint less than 73 degrees Fahrenheit. Supporters say treating the Bakken crude to meet these standards would cost 2 cents to 4 cents a gallon. In a statement issued by the pro-trade group Keep Washington Competitive, Spokane Mayor David Condon and Spokane County Sheriff Ozzie Knezovich panned the proposal, warning of potential lawsuits that would cost taxpayers. Condon attempted to block on constitutional grounds an initiative in 2015 that would have created a Worker’s Bill of Rights brought by the group Envision Spokane. The mayor hasn’t given any indication if he’ll move to block the coal and oil train fines, and the statement did not mention potential legal action. “If you choose not to warn and protect the taxpayers, you should expect a vigorous campaign against those on this council who are running to keep this seat,” Cates said. Fagan said he’ll work quickly to get the advisory votes onto the City Council’s agenda by next Monday. The deadline for the Spokane County auditor to receive initiatives for the November vote is Aug. 1. Those advisory votes ask whether City Hall should seek “additional funding sources” to fund a legal defense and consider reducing funding for other programs within the city budget to set up a defense fund. Fagan admitted having “a little help” drafting the advisory votes but didn’t say where that help came from. He’ll need four other council members to support a procedural vote to get the questions before the full council Monday night in time to make the ballot. “I ain’t going to hold my breath, because I’ll die,” Fagan said. Published: July 24, 2017, 9:29 p.m. Updated: July 25, 2017, 6:37 a.m.